Like it or not, Halloween weekend is here! It’s time for costumes, candy, scary movies and spooky cocktails. I love themes and what better time than Halloween to get creative with not only your attire, but your cocktail du jour. I scoured the web to share with you some of my favorite Halloween cocktail finds. The theme? Vampires! Saw something you liked and made it your Halloween mission to make it and try it? I would love to see pics! Instagram them to @carla327 or tweet them to @HauteCocktail! Have a safe and spooktacular weekend, everyone! For the Vampires of the night a Blood-Orange cocktail. Love that they are served in test tubes to take as shots and the label makes it even more fun! This is perfect to take to a party as its easier to transport. Recipe and picture from Sandra Lee’s Semi Homemade. I love the colors and ingredients alike in this Vampire Kiss Martini. Oh, and the combo of a drink with candy? Halloween perfection! To wrap up the 3-course bar menu, here is a dessert cocktail made with ice cream! 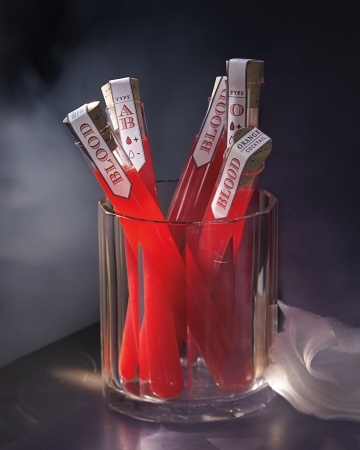 The Vampire Cocktail is the perfect cocktail to have to start the party after dinner time and the red grenadine blood looks tastier than a cherry for all you Vampiresses. Enjoy and Happy Halloween weekend! These look amazing! I am passing this on to my friend who is dressing as a vampire! Oh these are so fantastic!